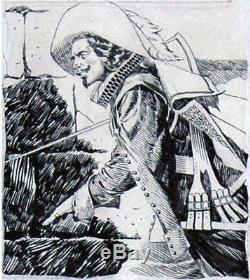 ARTURO DEL CASTILLO - MAN IN THE IRON MASK CAP 7 Page 2 ORIGINAL ART. First published in Film Fun in 1959. Those who have seen the late-50s British edition 3 Musketeers and Man in the Iron mask series created by del Castillo know it to one of the great masterpieces of the comic form. I've had the privilege of owning more than a dozen of these pages over the years and they are dazzling in person. This one is the last--and also the best of the lot. From Lambiek Comicpedia about Arturo del Castillo. Arturo Pérez Del Castillo was born in Concepcion, Chile. He started working for an advertising agency, but eventually joined his brother. In Buenos Aires, Argentina, in 1948. He got a job as a letterer and illustrator with Editorial Columba and its magazine Aventuras, and remained affiliated with the publisher until the mid 1950s. He did his first work for for the comic weekly Aventuras, and a year later, he also created comic strips for the magazines Intervalo and El Tony. He quickly became famous for his skillful and detailed penwork, mainly for western comics. Del Castillo refined his graphic style even further and other important works followed. He joined the Italian agency of. And from the late 1950s throughout the 1960s. He mainly worked for the British publisher Fleetway, starting with a number of comic strip adaptations of Alexandre Dumas novels, including'The Three Musketeers' and'The Man in the Iron Mask'. 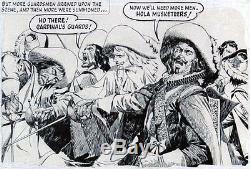 The Fleetway art on the 3 Musketeers and Man in the Iron Mask would prove to be some of the finest pen and ink illustration ever to appear in comics. Collectors who know this art know it to be a pinnacle of the form. I've owned more than a dozen Musketeers and Iron Mask pages over the years and they never fail to impress in every way. This one is the very last one from my collection--and it's the very best. Every panel here is just outstanding work and the final panel (signed by the artist) is practically jaw-dropping in it's complexity and level of quality--simply astounding work. There are some condition issues. There were a few tears originating from the left and top borders, with two of the left side panel with some tearing entering the image areas. This issue has been has been archivally restored but is still visible (seen scans). There is also white out use in the page and caption paste ups. My apologies for the high price for Global Priority, but costs have risen significantly over the past months. And I've gotten a lot of good feedback about packaging. The item "3 MUSKETEERS ORIGINAL ART MASTERPIECE ARTURO DEL CASTILLO CAP 7 Pg 2" is in sale since Thursday, December 22, 2016. This item is in the category "Collectibles\Comics\Original Comic Art\Interior Pages". The seller is "art_gurufunkel" and is located in Putney, Vermont. This item can be shipped to North, South, or Latin America, to all countries in Europe, to all countries in continental Asia.